by Matt Nicholas, Science Instructor. In freshman physical science, we are studying atomic structure. Protons, Neutrons, Electrons; these are the basic particles that make up every atom in your body and the universe. We are looking closely at how these particles interact with each other to give rise to the large diversity on matter we see every day. Of course, these sub-atomic particles are much too small for us to interact with directly, so we will be using several different types of models. We began our study of atoms by using ourselves to represent the particles. We made models of hydrogen and helium atoms with each student representing a different particle, the electrons got a bit dizzy after a while but we all survived. Next, we looked at a simpler model of the atom called a Bohr model, which is a 2 dimensional drawing of an atom. Some of the students were asked to draw their Bohr models on the board and explain how they used the periodic table to help them draw the correct structure. 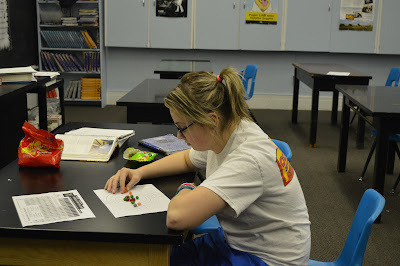 Finally, We will be creating the Peanut M&M/Jellybean model (patent pending) and using candy to make our atoms. The law of conservation of matter says that matter cannot be created or destroyed through normal chemical processes, but I have a feeling that some of the particles we begin with may not survive the experiment! 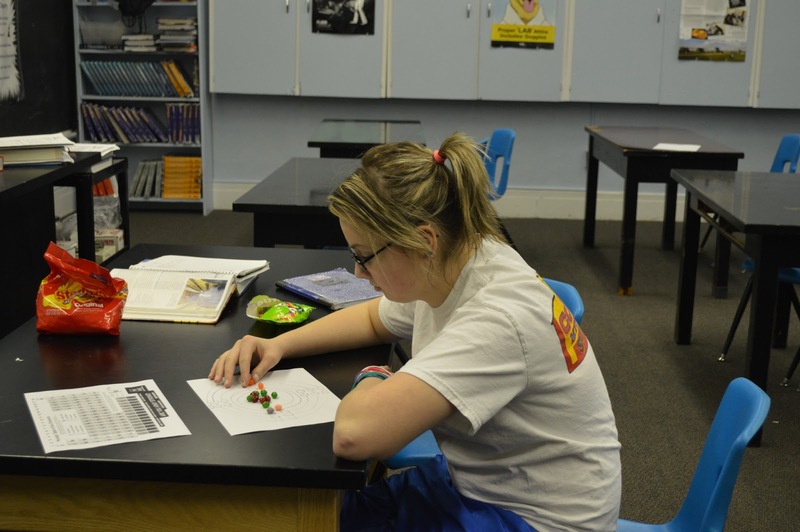 Pictured is Alexis Trauger planning her Peanut M&M/Jellybean model.